Lake Ontelaunee is a 1,082 acre lake owned by the City of Reading. The lake is located in Berks County along State Route 73 approximately 8 miles north of the center of the City of Reading. On April 22 and 23 Pennsylvania Fish and Boat Commission (PFBC) biologists set and pulled six trap nets in the no fishing zone of Lake Ontelaunee to assess the white crappie population. Although few white crappie were collected data taken on other fish species may be of interest to anglers. Most notable was the catch of channel catfish. During the survey a total of 224 channel catfish were collected with 39 being greater than or equal to 20 inches long. The largest channel catfish was 29 inches long. 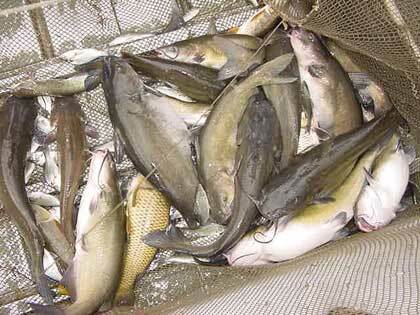 The catch rate of channel catfish was 1.25 per hour. 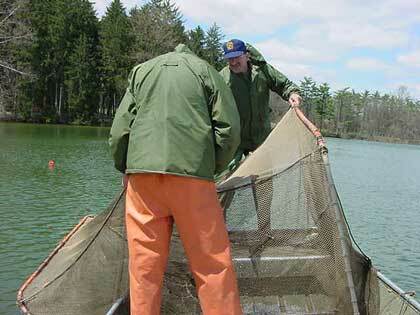 This means that 1.25 channel catfish were collected for every hour that the trap nets were fished. 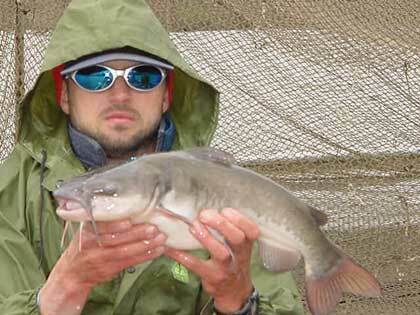 In other southeastern Pennsylvania lakes the average catch rate of channel catfish is 0.20 per hour. Furthermore, large channel catfish (> 20 inches) were collected at a rate of 0.24 channel catfish per hour. 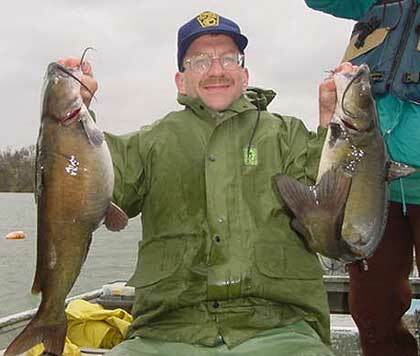 The southeastern Pennsylvania average is 0.04 channel catfish per hour. Clearly the Lake Ontelaunee channel catfish population was excellent. Three white catfish, a fish species often mistaken for channel catfish, were also collected during the survey. The largest white catfish was 19 inches long. White catfish can be distinguished from channel catfish by their large head in comparison to their body size, their wide mouth, white “chin” barbels, and their relatively shallow forked tail. The most abundant fish species collected during the survey was white perch. There were approximately 2,540 white perch collected with the majority being 6 to 8 inches long. The largest white perch collected was 9 inches long. Despite their marginal size in Lake Ontelaunee, white perch have a very good quality flesh and anglers who enjoy an occasional meal of fresh fish should consider adding white perch to their menu. Although largemouth bass are not typically captured in trap nets three largemouth bass were collected during the survey and these ranged from 17 to 20 inches long. Other sport fish species collected included 37 brown bullhead up to 13 inches long, bluegill between 4 and 6 inches long, and yellow perch between 5 and 8 inches long. Refer to Table 1 for a complete list of fish species captured during the survey. Table 1. Fish species collected during April trap netting at Lake Ontelaunee.